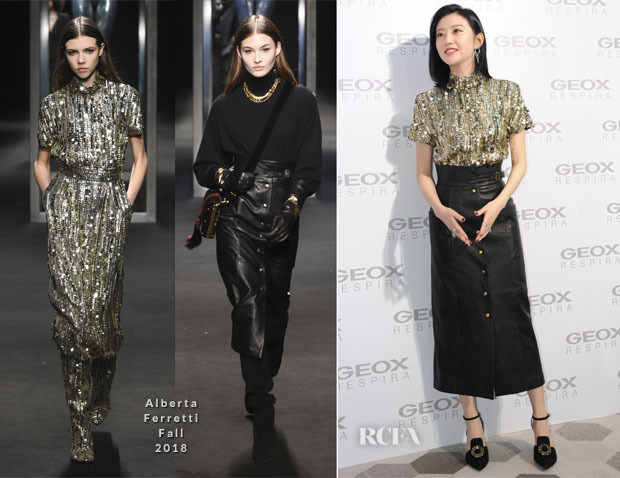 We’ve seen the embellished Alberta Ferretti Fall 2018 looks mostly in a head-to-toe presentation from Blanca Suárez, Dua Lipa and Heidi Klum, but Jing Tian opted to break up the runway look when she attended a launch event of Geox shoes on Saturday (November 240 in Shanghai, China. I love how the actress made the look more wearable by styling the embellished top with a midi leather skirt which features utilitarian detailing that were part chic and part edgy. The shoes felt a bit too prissy for the look, but no doubt this style was required for the shoe event.